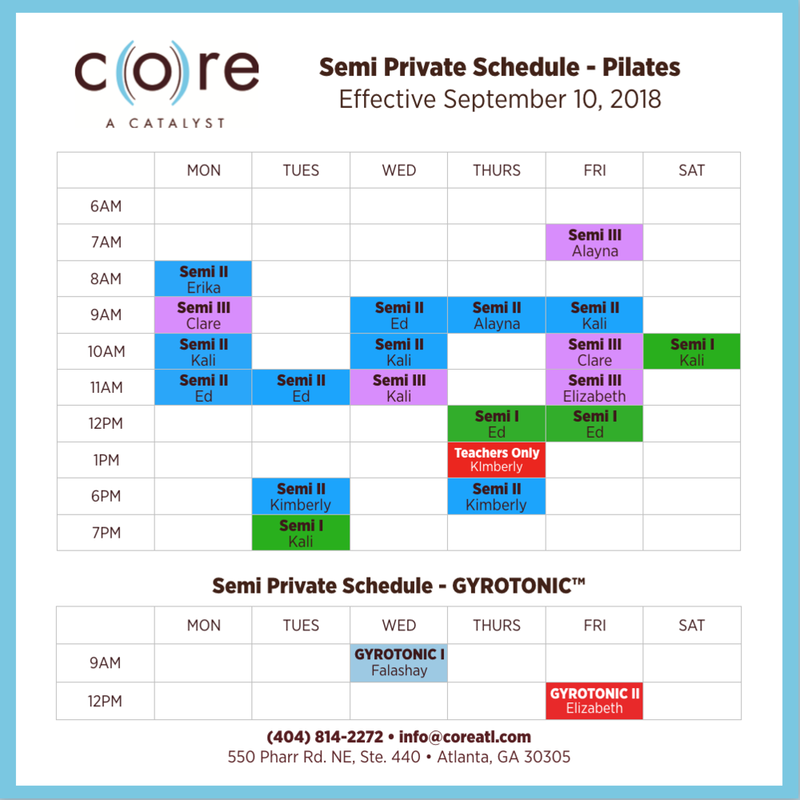 Did you know CORE is a teacher training center for Pilates, GYROTONIC(r) and Redcord teachers? In August, we hosted a Gyrotonic pretraining. One of our long-time clients, Caroline, took her first step on the teacher training journey, and team member Cherie updated her Gyrotonic Pretrainer license so she can be part of CORE's Gyrotonic teacher training team. Jessica is planning to run a Gyrotonic Foundation course in late 2018 or early 2019, so if you're interested in becoming a Gyrotonic instructor, reach out so we can get you started! On the Pilates front, Jessica just returned from renewing her license as a Host Advisor for TPC's programs in Boulder, and we're so excited to have more trainees in the studio. Falashay is almost halfway through her Pilates teacher training program, Ed is getting ready to start TPC's Bridge Program for instructors who have graduated from other programs, and our client Kimberly is getting ready to start TPC's Advanced Teacher Training Program. If you'd like to deepen your knowledge of Pilates but *don't* want to teach, consider TPC's Enthusiast program - you get to learn all of the material our trainees learn in TPC's online program with industry leaders Amy Taylor Alpers and Rachel Taylor Segel, but you don't have to go through the whole teacher training process. For more information, please contact Falashay Pearson. Our September theme is one of the key Pilates principles: breath. In yoga, we refer to breath as pranayama. Pranayama means Prana- the vital energy that is infinitely everywhere, and ayama- un-restrain. The practice of pranayama is mainly to remove toxins that block the flow of Prana in the body. For practical reasons, you can visualize that Prana is the energy that flows through the body and breath is what sustains it. Breath can facilitate core support and intensify movement. When you encounter an exercise that is difficult, ask yourself, “Am I breathing?” Often the answer is 'no' and just adding the breath can provide ease to the exercise.